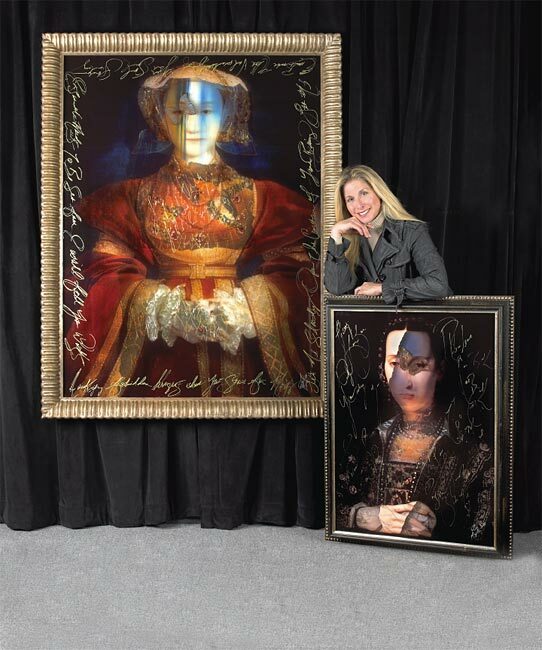 Ingrid Dee Magidson is an artist whose work has crossed multiple boundaries. It is difficult to put a label on her unusual work. It is at once ancient, using Renaissance images, long forgotten in the dusty archives of museums; and then it is incredibly timely with its use of modern and high tech materials. She calls her technique “Layerism:” transparent layers stacked so that the viewer sees through the images into the unique world Ingrid has created. Then objects, antiques, butterflies, toys, fabrics, and more become pieces of the world within her work. It is as if she has frozen time, and these ancient people are alive again filling the art with their dreams. The images one sees on the Internet are an approximation, necessarily flattened by photography. They are beautiful this way, but they come to life in person. As one moves back and forth, the layers and depth are revealed. One sees more and more over time. Ingrid’s works are beauty manifest. Your artwork is absolutely fascinating and very eye- and mind-inspriring. Am using your work as inspiration for my GCSE exams (AP I think in America), do you have any tips on how you create such interesting textures and where you get your inspiration?